Description: Designed for a sophisticated architectural look, this transitional fixture is designed with 5 tiers featuring curved Cream Linen Textrene shades, and complemented with a lower diffuser offered in Statuario Idalight. The canopy, decorative trim and hardware are accentuated in a Dark Burnished Antique Copper finish. Ideal for a conference room, foyer, lobby or other large spaces, this fixture is custom crafted in the USA. 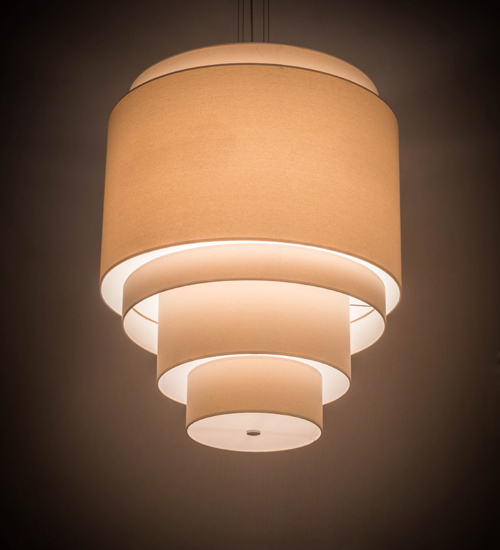 Custom sizes, styles, colors and dimmable energy efficient lamping options such as LED are offered. The 31-inch wide fixture is UL and cUL listed for damp and dry locations.